I have not been able to write about many performances so far this year as I have been working on a new production at Heather Eddington’s State of Flux in Ipswich. 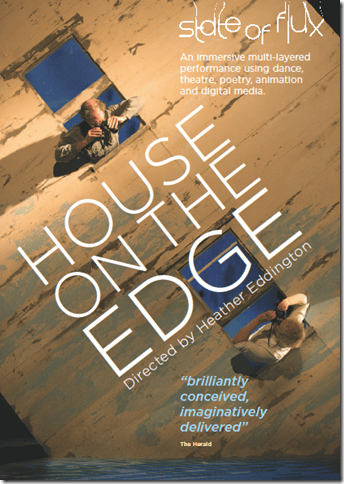 It is Heather’s House on the Edge, which has its first public outing this Friday, February 8 at Dance East’s Jerwood DanceHouse. In a recent telephone interview (it starts 49:33 into the broadcast) BBC Radio Suffolk’s Stephen Foster introduced me as the lead male dancer, which sounds rather grand; I am in fact the only male dancer and Ann Dickie, who plays my wife in House on the Edge, is the only female dancer. The third character is the actor, Pradeep Jey, who plays with great versatility both an envoy from the local council and nothing less than the sea itself. Heather had asked me to add blogs on the creative process for her State of Flux site, where you can also see some photographs from a publicity shoot with Chris Nash and some of our own. Nearly all this material is copied from, or derives from that blog. House on the Edge has its origin in the erosion of the Norfolk and Suffolk coastline that Heather knows well, and in particular the effects of erosion on the community of Happisburgh, What was once far from the edge of the cliffs is now closer to the edge, and what was once close to the edge is either in danger of falling or has already fallen into the sea. It is a very slow process where nothing appears to be changing until the invisible forces within the cliffs suddenly manifest. Heather’s narrative takes Happisburgh as a metaphor for living on the edge in a precarious balance between the physical (solid ground, security, responsibility, conventional wisdom) and the spiritual (the elements, the unknown, irresponsibility, intuition). Life is never either black or white, nor is this balance a matter of keeping to one side or the other. The elderly couple at the heart of House of the Edge — Edward, who has lived in the house all his married life and wants to stay and his wife Lucy who is torn between looking after her husband who has terminal cancer and accepting what the council calls managed retreat — are in a constant turmoil as to how to harness the elements that encroach on their precarious lives. Much of House on the Edge is built up through the creative use of improvisation. The text by Anna Selby was sketched out during discussions and improvisation exercises last year. As a dancer, I had always preferred to be told what to do by a choreographer, but this new experience has been a revelation. My first improvisation was with Ann. It was a verbal improvisation in which her contribution was limited to one line, ‘We should leave’ and mine was limited to ‘We should stay’ and we had to continue until one of us conceded. I could not understand how this could possibly resolve, but it did. Since that first attempt, many of the qualities of our respective characters and of the relationship between us have been suggested through similar improvisations — some more successful than others — but each time there is something to learn. Verbal improvisation has led to physical improvisation to find external expressions of internal ideas. In the course of creating the work, some of these movement phrases have been reworked as set pieces and we go through an awkward phase of losing the spontaneity that improvisation gives until we find that spontaneity again in rehearsal and performance. Only recently did I realise that improvisation is at the heart of our entire social interaction; our goal in rehearsing is thus to return to this fundamental form of communication. ‘Here’s a poem. It is 18 lines long. Each line has between one and 10 words. Find a single movement or phrase for each line.’ This was my task one day, and I had the luxury of working in one of those beautiful studios at the Jerwood DanceHouse to complete it. A friend has cancer of the esophagus and thinking of her I found a phrase for the first line — ‘illness’ — quite quickly. ‘Eyes in the grass’ was another line I was able to translate, if rather literally. ‘Pouncing on you when you are relaxed’ was clear in my mind but I couldn’t find a way to do it physically. For ‘pushes you to a point of no return’, I had in mind something between a Martha Graham back release to the floor and an image of a sculpture by Ernst Neizvestny (from John Berger’s book, Art and Revolution). Others proved more difficult to approach: ‘us’ and ‘shapeshifting’ were two (‘bellyflop’ I didn’t attempt). By the time Heather came up to see how I was getting on, I had a repertoire to show her, though I was less than confident it would be of any use. She numbered each line and my corresponding movement phrase, making only one critical observation: I had to purge my phrases of anything from a previous choreography or style I had known. The Martha Graham release was out, but a little of Neisvestny left in. Then she said, ‘Put 1 and 3 together, then add on 6, then 4. ‘What have you got for ‘us’?’ I did the first thing that came into my head. ‘Great. Put it after 4. Repeat 1 from that position, then again kneeling. Add another 3, then a prolonged version of ‘shapeshifting’ into ‘moment of stillness’. She helped me find a way to ‘pounce’ and that was added on, followed by another ‘eyes in the grass’, ‘moment of stillness’ and ‘us’. Two variations of 1 (illness) rounded it off. While I had been working in the studio, Heather had been working in the theatre exploring material with Pradeep that she wanted to overlay on the Illness dance. The interaction between Edward and the Sea is a vital relationship in House on the Edge, and this weaving of the two characters became a key dramatic scene near the end of the piece. We ran the two together later in the afternoon. Last Friday we ran the piece from beginning to end for the first time, in costume (by Sarah Beaton), working with the lighting and projections (by Magali Charrier with technical assistance from Ben at GaiaNova) and with various musical choices. Having worked on individual sections intensively for the past week (under the guidance of theatre director Laura Farnworth), it was difficult to maintain that intensity going through the junctions and intersections, but going from beginning to end with the occasional ‘where do I go now?’ gave us at least a physical and narrative arc on which we can work for the final week up to performance on February 8. We are beginning to inhabit the characters, to make them our own and that in turn informs our physical interactions. What remains is a process of further filling out of both character and movement, moulding all the elements together until they have a logic and arc — and a life — of their own. Before starting the project I had not heard of Happisburgh and was not aware of this phenomenon of cliffs collapsing and houses falling into the sea. One of the first resources we dipped into was Richard Girling’s book, Sea Change: Britain’s coastal catastrophe, a good starting point. Last weekend I had a free day and decided to go to Happisburgh. Heather had already taken us to Dunwich to get a sense of the effects of coastal erosion, but most of mediaeval Dunwich is already well under the sea. Happisburgh is still a community of solid houses, a school, the Hill House Hotel, an operational lighthouse painted in bright bands of red and white, St. Mary’s Church and an Arts and Crafts era manor house. There is also a broad swathe of caravan park located between the village and the cliffs where at least one caravan stands perilously close to the edge. The cliffs are high and susceptible not only to the external battering of the sea but also to the internal buildup of groundwater. For now there are some sea defences in the form of rocks and wooden revetments, though the latter are in dire need of repair — or have they been abandoned? To counter the groundwater risk, drainage channels have been dug along the cliffs from which plastic tubes project at intervals to channel off the water. It is difficult to imagine the cliffs crumbling, but photographs and studies tell of the brutal reality. The edge of the coastline has been receding inexorably and unless human ingenuity and political will can together find a solution, this beautiful town may, like so much of the once-flourishing Dunwich, disappear under the sea. I fell in love with the place, as have many others before me, but I imagine it takes a certain stoic optimism and perseverance to live so close to a crumbling edge. Certainly my visit has given me images with which to work in preparing House on the Edge, and beyond that perhaps Heather’s work can draw more attention to the cause of preserving such beautiful towns and villages — and the lives and livelihoods of their residents — along the North Sea coast.